Born at 13 Clinton Street in Buffalo in 1845, John D. Larkin went on to become one of the most successful businessmen Buffalo has ever had. Developing from his experience in the soap industry with his brother-in-law Justus Weller in Buffalo and Chicago, the Larkin Company, established in 1875, became one of the dominant mail-order businesses in America. 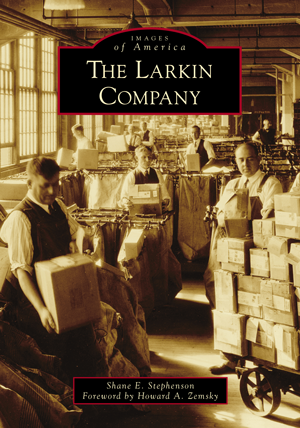 In 1885, Larkin and his wife's brother, Elbert Hubbard, promoted "The Larkin Idea," which brought the business a national customer base through "Factory to Family" direct sales. At the height of the company, 90,000 "Larkin Secretaries" established clubs to bring Larkin soap and other products to women in their neighborhoods. This system of secretaries and clubs created an external promotional engine unlike any other previously known. The company closed in 1967, leaving its mammoth footprint in Buffalo's Hydraulic neighborhood, now aptly called Larkinville. Shane E. Stephenson is a part-time archive and library technician at the Buffalo History Museum and the owner of Archives in the Buff. This is his second book with Arcadia Publishing. The images in this book come from a variety of sources such as the Buffalo History Museum and private collections.